After our stay in Big Bend, we turned toward Texas’ other National Park, Guadalupe Mountains. This park is located about four hours north, just below the border with New Mexico. It contains the highest mountain range in Texas, including the highest point in the state. The peaks are the remnants of an enormous reef that formed at the edges of an inland sea during the Permian period about 250 million years ago. Sediments then covered the reef for ages, before uplift and erosion re-exposed the rock beginning 65 million years ago. The National Park covers the portion of the Guadalupes in Texas, but the range extends to the north into New Mexico, where an entirely different world awaits. Carlsbad Caverns National Park lies within the same geologic formation just 30 miles north in New Mexico. Here, petroleum deposits deep underground seeped up and reacted with groundwater to form sulfuric acid that dissolved enormous caverns in the limestone. Then, mineral-rich water filtering from above slowly built dazzling formations. In 1898, local ranch hand Jim White thought he saw smoke rising from the land and went to investigate. Approaching, he discovered millions of bats exiting a huge hole in the ground. 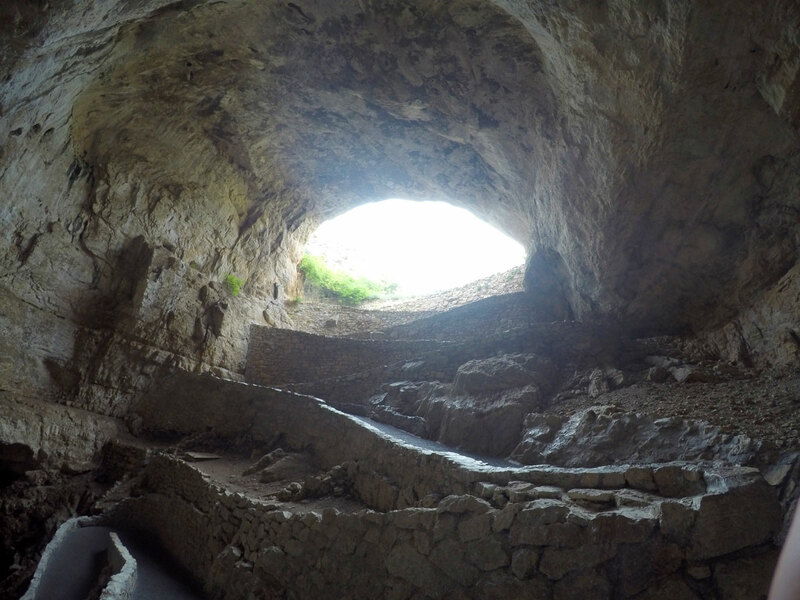 He explored the cave by lantern light, named many of the rooms and brought the cave to the attention of the public. It became a National Monument 25 years later in 1923. Like Big Bend, this is another remote region, with no services near Guadalupe Mountains and only a few options near the entrance to Carlsbad Caverns, but their proximity makes for a convenient double park visit. Due to the lack of hotels convenient to Guadalupe Mountains, we needed an overnight stop on the way from Big Bend. The famous art destination of Marfa, Texas fit the bill perfectly. I’ve wanted to visit Marfa since reading about it years ago, mostly for the novelty of having such a vibrant cultural scene so far from anywhere. The present popularity got started in 1971 when the artist Donald Judd rented a house in Marfa. He needed a place to get away from the bustle of New York City, and the empty desert spoke to his minimalist sensibilities. Years later the effect of art on the town has been transformative. What otherwise might be a dusty, forgotten spot in the high desert has a strong tourism industry. Our visit happened to be on a Monday, when many businesses are closed, but we still found enough to see and do to make it worth a night. There are numerous lodging options in Marfa, several quite unique. We ended up at the historic Hotel Paisano, which offers comfortable beds, a central location and a nice patio for enjoying a beer. Having done some research ahead of time, we knew the Judd Foundation is open on Mondays, so we walked a couple blocks to the office and bought tickets to the 4:30 tour. This visit covers “La Mansana de Chinati” (a.k.a The Block) where Judd had his home and studios. The whole complex is surrounded by an adobe wall and contains two huge former hangar buildings in addition to his house, pool and various outbuildings. Highlights are the library and rooms filled with his works. Upon his death in 1994, orders were to leave the block as it was, so nothing has been moved since he last left his home. The nearby Chinati Foundation also showcases art by Judd and his contemporaries and there are lots of galleries around town. 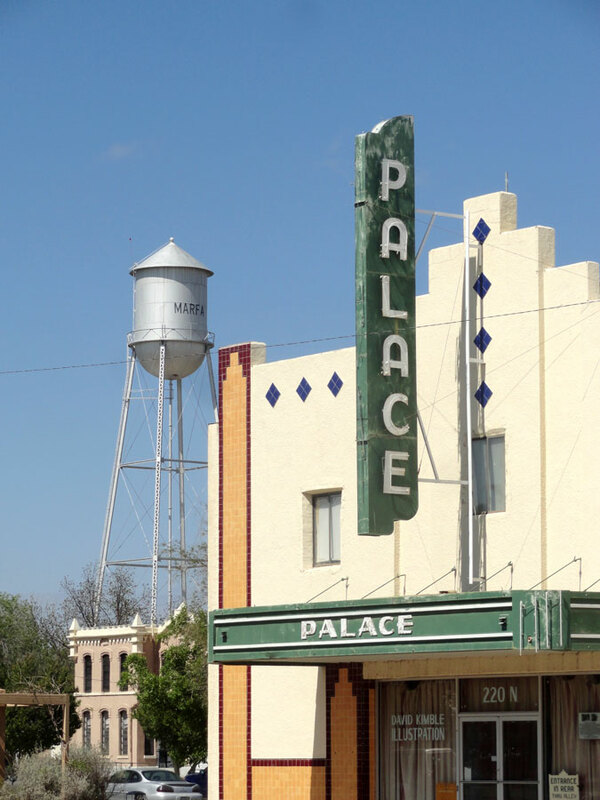 Plan on visiting during a weekend for the full Marfa experience. Marfa is filled with more food options than any town of 1,733 residents has any right. Again, Monday isn’t the most lively day to visit, but we had a wonderful meal at Cochineal including modern cocktails normally not found outside big-ish cities. The following morning we picked up some breakfast at a grocery store and headed up Highway 90 through the high plains toward Guadalupe Mountains. On the way, we stopped at the roadside art installation of Prada Marfa. This false luxury retail storefront has stood along the highway since 2005 attracting sightseers by looking purposely out of place. Approaching Guadalupe Mountains from the south was a magnificent sight, with the bluff of El Capitan standing imposingly out the windshield. Guadalupe Peak itself was hiding in some morning clouds that had yet to burn off. The park is just two hours by road from Marfa, and we crossed into the Mountain time zone on the way, arriving at 10am. Our main goal was to hike Guadalupe Peak, so arriving fairly early in the day was essential. This park is the least-visited of the NPS sites we saw on this trip and it was apparent by the hushed atmosphere. We checked out the Pine Springs visitor center, filled our water bottles and parked at the trailhead near the campground. Several trails depart from this central location, including hikes to Devil’s Hall, The Bowl and Bush Mountain. We signed the trail register and counted only 11 names that had set out for the summit earlier than us. Going into this hike, we knew it had some serious climb. Compared to our South Rim hike at Big Bend, the Guadalupe Peak Trail has 1,000 more feet of elevation gain in 1.75 fewer miles. There’s no warm up slope here, the route is basically a relentless incline for 4.25 miles, gaining 3,000 feet. The first third of the hike zigzags up an extremely steep east-facing slope, but achieving elevation from the start has its benefits: there’s no wait to get a view. Turning around after just the first few switchbacks reveals a sweeping vista over the visitor center and across the Delaware Basin. About a mile and a half in, the trail hops over a ridge and begins traversing a north-facing slope. This section offers some shade, and while it still climbs rapidly, there are fewer switchbacks here. 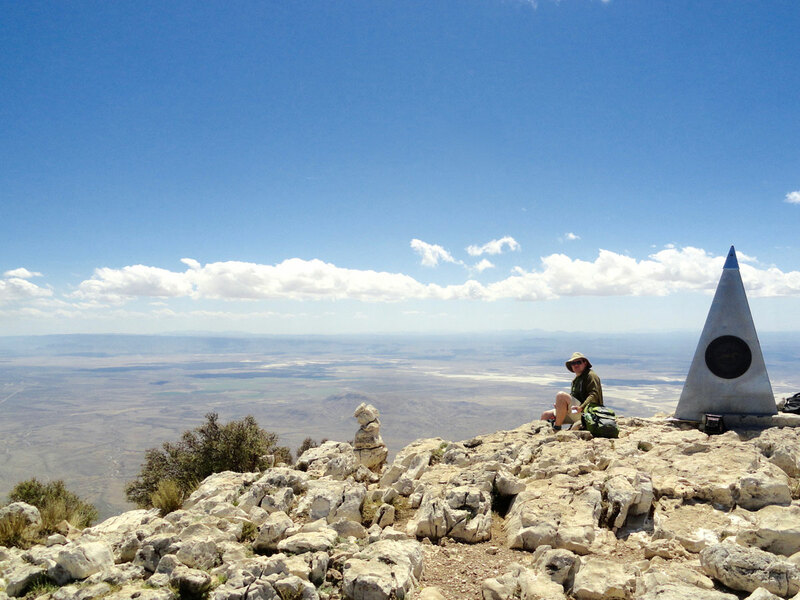 Around mile 3 there is a short spur trail leading to the high-altitude Guadalupe Peak Campground. Ahead, the true summit comes into view. Even after hiking for a couple hours, it still looks high. A brief level portion gives the legs a break and crosses the highest bridge in Texas, a small wooden decking structure over a rocky crevasse. The last mile is on rockier, treeless southeastern-facing slopes, with a cool view of the top side of El Capitan on the left. After a few final pushes, we arrived on the summit. The high point is marked by a stainless steel pyramid commemorating the Butterfield Overland Mail route. From up there the view is amazing, with the green swath of the Guadalupes to the north and the wide Delaware Basin stretching off to toward the east. To the west, a field of gypsum sand dunes in the park is visible as well as some circular, irrigated fields in the distance. An old ammunition box serves as a summit log, with a book to sign and assorted mementos left by previous visitors. I dropped a highkicktravel business card in there for a future hiker to discover. There was only one other person at the top when we arrived, and he left shortly after, so we had the peak to ourselves. For our summit picnic lunch, we packed sandwiches from a Subway in Van Horn. (Mental note: go ahead and get the footlong sub when planning to hike several miles.) After taking in the view for about 45 minutes, we turned back to the trail. I always debate whether climbing up or going down is more difficult, but I’d say it’s about even on Guadalupe Peak trail. The nearly constant grade is tiring in both directions. We must have been taking more time to look around on the way down, because we both commented several times “I don’t remember this part on the way up.” Nearing the home stretch, several mule deer appeared in our path, so we all stood in mutual curiosity for a few minutes before they bounded off into the brush. After returning to the car, we continued up Highway 62 across the border into New Mexico. Whites City, New Mexico is a rather sad little outpost right at the entrance road to Carlsbad Caverns National Park. You can tell from the empty motel and shop buildings that there have been better days, but it’s clear most visitors today stay in the town of Carlsbad, another 20 miles up the road. We spent the night at the Rodeway Inn, which has low rates, large rooms and free waffles for breakfast. The main appeal is that it is just minutes from the park visitor center, but we ended up driving to Carlsbad for dinner that night anyway. We chose the Trinity Restaurant where we were introduced to New Mexican wine and ate unique Mexican-inspired Italian dishes. Looking back at the last slice of daylight after entering the cavern. The next morning, we had just a seven mile drive to get to the Carlsbad Caverns visitor center. We booked a ranger-guided King’s Palace Tour ahead of time, so we picked up our tickets at the office and browsed the exhibits while we waited for the 9:00 announcement of the daily cave-opening. We took the short stroll to the natural entrance, got briefed by a ranger and began our descent. During our visit in April all the elevators were out of service, so everyone was required to enter and exit the cave on foot. (As of May 20, one elevator has been restored.) The natural entrance route descends 750 vertical feet in a little over a mile, so it’s not an insignificant hike, but all areas open to visitors have paved trails and railings, easing accessibility. Just below the bat-watching amphitheater, the route begins a series of wide switchbacks, dropping gradually under the rim before heading directly in. Thousands of Cave Swallows careen around the entrance in all directions, making a racket and causing us to fear looking up. It also doesn’t smell so pleasant here, like a combination of musty basement and bird droppings, but it’s easy to look beyond that once you see the first room open up ahead. Once the last bits of natural light fade away, the trail begins a steep descent, winding back and forth across the cavern and passing some wild formations. Decorations like the Whale’s Mouth and the Witch’s Finger are just previews to what lies below. The ceiling seems impossibly high at times, almost disappearing into the darkness beyond the reach of the new LED lighting system. As the trail continues spiraling downward, it seemed like we’d never reach the bottom, but after about an hour, we finally made it. Tour groups meet the ranger in the cafe area. Sidebar: The existence of a 1950s era souvenir and snack shop down there is odd, but follow the natural tunnel to the restrooms for a totally surreal experience. It looks like a totally average office building restroom plopped 750 feet underground. Ranger Alyssa began her 10:30 King’s Palace presentation in the cafe before leading us to a locked gate a little ways back on the entrance trail. The rooms on this tour: Kings Palace, Papoose Room and Queen’s Chamber are among the most spectacularly decorated chambers anywhere. Guests are only allowed in these rooms with ranger supervision, because in the past, people loved to break off pieces of cave decorations as souvenirs. Idiots. Thousands of stalactites and soda straws hang from all the ceilings, while the Queens Chamber contains beautiful draperies. Alyssa’s specialty is geology, so the talk was highly informative on how the cave was created and how all these different speleothems (cave decorations) were formed. Ecology is a common theme in the cave talk too. At Green Lake, we learned that years ago scientists found elevated levels of metals in the water. The source was cars in the parking lot 850 feet above, so the lot was moved and fitted with a filtered edge to keep pollution under control. With an hour and a half and one mile of walking, the Kings Palace tour was a great introduction. Tour times and availabilities vary throughout the season, so check schedules to see what interests you the most. Panorama taken in the Big Room. This room is 625 feet wide. After that we set off to see the self-guided and appropriately-named Big Room. This is one of the largest cave chambers in the world with dimensions of 4,000 feet long, 625 feet wide and 255 feet high at its peak. The floor area alone could hold just over 6 football fields. 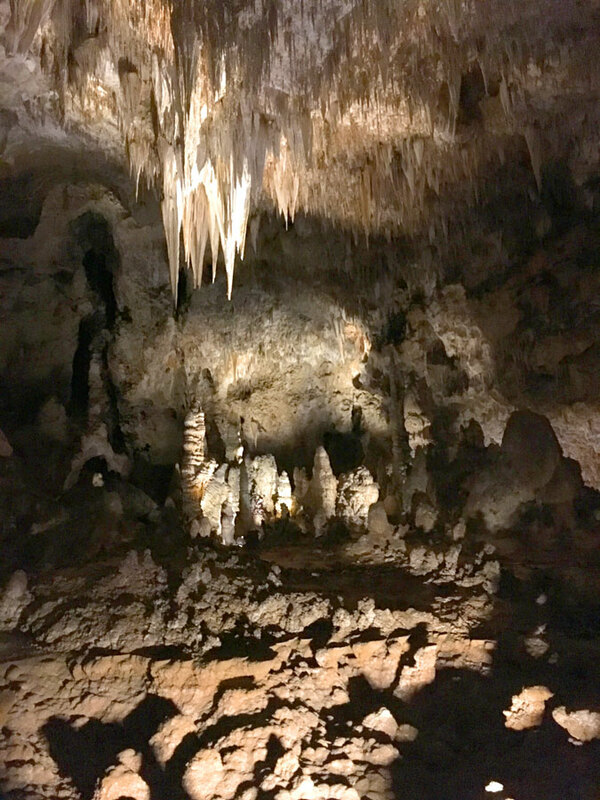 There is a mile of paved walkway that twists through varied and ornate formations, from the six-story-tall “Giant Dome“ to the many small, minion-like stalagmites called “Fairyland.” Plan on spending about an hour and a half exploring this portion of the cave, it’s worth the time, and every curve reveals new surprises. In one area, the path overlooks the expansive chamber called Lower Cave that can be explored on a special tour. At another spot, you can peer down into the Bottomless Pit, which was actually thought to be bottomless for a time; measuring later confirmed its depth at 140 feet. Finishing the loop brings guests back to the junction that splits routes to the cafeteria or the natural entrance. When the elevators return to service, visitors will head there at this point. We had to slog our way back up 750 feet via the Natural Entrance route. We made good time on the return hike, as we were used to climbing after our Big Bend and Guadalupe Peak hikes, but it’s still a haul. To be honest, I preferred not using the elevators because it felt more authentic and seems to have thinned the crowds a bit. Also, entering on foot gives you a true understanding of the depth of the cave’s chambers. Considering the lack of elevators, we surprisingly found ourselves to be among the youngest visitors there that day. One important thing to remember about Carlsbad is that no photos taken with a cell phone will ever do it justice. It’s such a foreign sight to the eyes that it can’t really be described in words either. The sense of scale is mostly lost in the photos we took, so that we can hardly remember on which part of the tour they were taken. Unless you’re a professional, just take a few key photos in well-lit areas and plan to take the rest in with your eyes. Back on the surface we had lunch at the visitor center cafeteria before heading off for another otherworldly New Mexico destination, White Sands National Monument. View the whole gallery of images from our trip here. This entry was posted in Travelogues and tagged Carlsbad caverns national park, Guadalupe mountains national park, Guadalupe Peak, Judd Foundation, King's Palace Carlsbad, Marfa, New Mexico National Parks, Texas national parks. Bookmark the permalink.